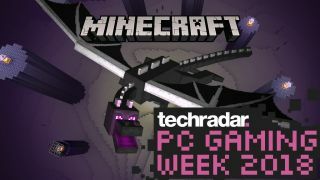 As part of TechRadar's PC Gaming Week 2018, we take a look at the history of Minecraft, from its humble beginnings to being the best selling PC game of all time. "I don’t see myself as a real game developer. I make games because it’s fun, and because I love games and I love to program"
Our story begins back in 2009, when a number of people had some seriously good ideas. One was Zach Barth, now known best as the founder of perennial puzzle innovator Zachtronics, who coded and released multiplayer mineral-em-up Infiniminer over the course of a few months, abandoning the freeware project after its source code was leaked. Another was Swedish coder Markus 'Notch' Persson, just shy of 30, and previously a developer on sandbox MMO Wurm Online. Persson was working in his spare time on a kind of Dungeon Keeper/Dwarf Fortress/Rollercoaster Tycoon combo (as odd as that may sound) named RubyDung. Attempting to introduce a first-person view into the game, he was less than satisfied with his results – and then he found Infiniminer. "My god," wrote Persson on his Tumblr, "I realized that that was the game I wanted to do... I tried to implement a simple first person engine in that style, reusing some art and code (although not as much as you’d think) from RubyDung." Even his very first version, coded in Java, is immediately identifiable today: even though it wasn't yet formally named, this was Minecraft. "The response was very positive," wrote Notch a few months later, "and I was blown away [by] the framerate, and how well it ran in a browser, so I decided to go for it." Pulling in character models from an earlier game idea named Zombie Town, he put the first alpha version of the game, now sporting that iconic name, up for test. It received an immediately positive response. Players were fascinated by Minecraft's freedom and its creative nature, so Notch quickly went to work on adding new features. Within a month, Minecraft had sand, water, lava, rudimentary dynamic lighting. Within two months, the earliest multiplayer tests were underway, and the speed of development picked up even further. Development quickly moved towards a paid Alpha version, which required a premium account for access. Minecraft's Alpha sales began on June 13th 2009. Less than a month later it had sold over 1,000 copies and gained over 20,000 registered players, enough for Persson to scale back the hours spent on his day job and dedicate more time to Minecraft's development under the Mojang Specifications banner. Later in 2009 Minecraft's Creeper-toting survival mode began testing, which turned Minecraft from a neat toy into a proper game, and led to sales that, even at a discounted rate for early adopters, were strong enough that Persson was able to leave his day job in May 2010, a year after the game's initial tests; by June, 20,000 paid accounts were registered. Creepers. Why did it have to be Creepers? An explosion in development, which saw a regular Friday update schedule adding features like redstone, minecarts, dungeons and spooky underworld The Nether in quick succession, led to another explosion in sales, and caused Persson to expand the number of brains working on Minecraft. Mojang Specifications morphed into Mojang AB, founded alongside other Swedish coders, part of a group which, along with Notch himself, had been courted by Valve – a company which, at the time, was still interested in producing its own games. The duo was soon joined by business developer Daniel 'Kappische' Kaplan, followed by CEO Carl Manneh, hired (on his own advice) from Persson's previous employer jAlbum, artist Markus 'Junkboy' Toivonen, and coder Jens 'Jeb' Bergensten – and as Minecraft's sales continued to expand, the team would continue to grow along with it. "Minecraft certainly became a huge hit, and people are telling me it’s changed games. I never meant for it to do either." Even with Minecraft still very much in its early stages (although now playable in its own browser-free client) our pals at PC Gamer magazine made Minecraft its game of the year in 2010. "Minecraft sits among the very best of games, just because you can play so many games inside it," wrote Jaz McDougall. "It's a primal urge – to build a goddamn hill fort – in gaming form." The snowball kept rolling downhill. January 12 2011 marked the milestone of one million Minecraft accounts registered; the wave of hype, and Minecraft's core of accessibility and simplicity, saw 10 million accounts registered just 6 months later. This was a hot property, and it was time for it to spread its net even further. But, Minecraft had a pretty fundamental problem: Java. Notch's original choice of programming language was, while somewhat awkward, perfect for Minecraft's requirements at the time. It had already aided in fostering a growing scene of modders tweaking Minecraft to their own ends, and facilitated cross-platform play between PC, Mac and Linux. Those mods, while unsupported, extended the game often in a very positive way; some (including pistons and horses) impressed Notch and Jeb enough to make their way into the game proper. The complex overheads of Java, not really made for games as heavyweight as Minecraft was becoming, were an impediment on absolutely every other platform. To truly get Minecraft out to the masses, an entirely distinct branch of the game entered development for the rising smartphone market: Minecraft Pocket Edition, now coded in C++. Minecraft Pocket Edition wasn't quick off the mark – it has consistently lagged behind mainline Minecraft in terms of features since it was revealed – but it brought Minecraft first to Android (specifically the Xperia Play) and then to iOS. Five days after the reveal of Pocket Edition, yet another C++ branch emerged during a presentation at 2011's E3: the console edition. Initially an Xbox 360 exclusive title, it was developed out of house by Scottish developers 4J Studios. The Java edition was not left behind by any means. Formally leaving its Beta stage at the Las Vegas MineCon convention in November 2011 (and jumping up to double the price of its initial Alpha release) it continued to be the bearer of new features; version 1.0 introduced The End, adding a formal ending to the game. It also marked the end of Notch's lead role on the project, as he handed over the reigns to Jeb, who remains the project lead to this day. “I think I'm more interested in doing new development of new games, rather than maintaining a game,” Notch told PC Gamer. Notch himself moved on to other development projects, although he scaled back his efforts to hobby projects and challenges which interested him after creative block caused his first major follow-up project, 0x10c, to fizzle out. Shortly after the official release of Minecraft, the team behind multiplayer mod Bukkit joined the Mojang team, helping to improve the multiplayer experience and develop a mod API. This, and an ongoing scheme of regular updates and additions, meant that Minecraft's formal release wasn't the end of its development story by any means. Bolstered by its absurd sales figures and a growing popularity with kids, Minecraft's extra-curricular activities increased. Toys and branded merchandise flooded the shelves, and the first Minecraft LEGO set – created after a successful campaign on the company's Cuusoo (later Ideas) scheme – was released just a month after the Xbox edition emerged. The latter was (as expected) an immediate success, shifting a million downloads in five days, selling an average of 17,000 copies per day after its May 2012 release, and racking up over 4 million sales on Xbox Live Arcade alone by October 2012. By April 2013, shortly after the release of the education-focused Raspberry Pi edition of Minecraft, the Java and Pocket editions surpassed 10 million sales each. Later in 2013, the game's exclusivity clause with Microsoft elapsed, and versions for PS3, PS4 and PSVita were announced; Minecraft had well and truly outgrown its indie game status. And Persson, as the oft-maligned figurehead of the biggest gaming phenomenon the world had ever seen, was struggling under the weight of online pressure. "Anyone want to buy my share of Mojang," he tweeted in June 2014, "so I can move on with my life? Getting hate for trying to do the right thing is not my gig." CEO Carl Manneh's phone immediately lit up with enquiries as to whether Persson was serious. He was: Activision Blizzard and EA each expressed an interest in picking up Mojang, but the company's prior relationship with Microsoft (and, presumably, a superior monetary offer) saw a deal being made. "I’m not an entrepreneur. I’m not a CEO. I’m a nerdy computer programmer who likes to have opinions on Twitter." The Redmond company hadn’t always been particularly interested in Minecraft, at least if one-time Microsoft-contracted developer Peter Molyneux is to be believed. "I can remember coming to things like [Gamescom] back in my Microsoft days and talking to Microsoft," he told GamesRadar. "They thought it was rubbish. You know, it didn't have a character, it didn't have a story, it didn't have a tutorial, the graphics were, you know, like 1980s graphics... they totally, totally missed that." They didn't miss it in late 2014. Following the launch of Minecraft's paid-for online server option, Realms, and ten days after the launch of Minecraft on Xbox One, it was announced that Notch and co. were to sell Mojang to Microsoft for a cool $2.5 billion. The completion of the deal on November 5 2014 marked the end of the founders involvement with the company – Persson, Porser and Carl Manneh departed Mojang. Under new leadership, but maintaining the same dev team that had driven it since Notch's original sidestep in 2011, Minecraft's expansion rolled on. MineCon 2015, at London's Excel centre, broke the Guinness world record for the largest convention for a single videogame. The Pocket edition was ported to Wii U, Windows 10, Samsung's GearVR, Apple TV and beyond. By 2016, total sales for Minecraft across all platforms hit 100 million. Meanwhile, Pocket Edition finally (after five years) reached version 1.0. A Chinese beta followed in 2017, preceding the most significant behind-the-scenes update in Minecraft's history: the Bedrock Engine. Released as part of the 'Better Together' update, the Bedrock Engine brought every platform running some form of Pocket Edition, from mobile to console to Windows 10, into line with each other under the hood, and over it too. Cross-platform multiplayer and unification of DLC items landed, along with 4K graphics and planned upgrades to the non-Java Minecraft (now dropping the 'Pocket Edition' tag and simply going by 'Minecraft') would happen simultaneously. There's still a division within Minecraft – the now-explicitly named Minecraft Java Edition continues development under its own internal team at Mojang. "In one sense, it belongs to Microsoft now. In a much bigger sense, it’s belonged to all of you for a long time, and that will never change." So what's next for Minecraft? Standing at 144 million paid accounts and boasting a record of 74 million simultaneous players as of January 2018, and surely on its way to ousting Tetris as the top selling video game of all time, Minecraft doesn't show any signs of going anywhere. The mod scene, bolstered by integration with the Twitch launcher, continues to thrive. The game continues to be a big draw on YouTube. Meanwhile, merchandise sales haven't dipped; Minecraft has become a staple of Lego's commercial efforts. And there's even a movie on the way, due for release in May 2019, although details about it are currently scarce. What we do know is this: there's an infinite world out there. One man's idea, and another man's experiment, have grown into something that has delighted an entire generation of kids, and changed the way we think about games. Minecraft isn't a graphical masterpiece, and it's not, by any stretch of the imagination, a game with an AAA storyline. It's an experience that remains as relevant today as it did nine years ago – and how many games can say that? TechRadar's fourth annual PC Gaming Week is officially here, celebrating our passion with in-depth and exclusive coverage of PC gaming from every angle. Visit our PC Gaming Week 2018 page to see all of the coverage in one place.